Today I have my attempt at covering up OPI, I Theodora You from my last post. I have this awesome milky sheer jelly polish with iridescent glitter and irregularly shaped gold glitter pieces that I knew would look perfect over this pink jelly. I was hoping the milky white base in Wet n' Wild's Mountain High (collaboration polish line with Fergie) would blend in well with the slight streakiness of I Theodora You. I have tried out Mountain High on it's own but it it way to sheer unless you want total visible nail line. It is quite pretty on it's own, and I know some people can pull it off, but my nails are just brutal this winter, not good to look at au natural at the moment! Anyways, this is one of those glitters you really have to dab on the nail to get a good amount on the nail. So I blobbed on one coat for each nail, and I love the outcome! 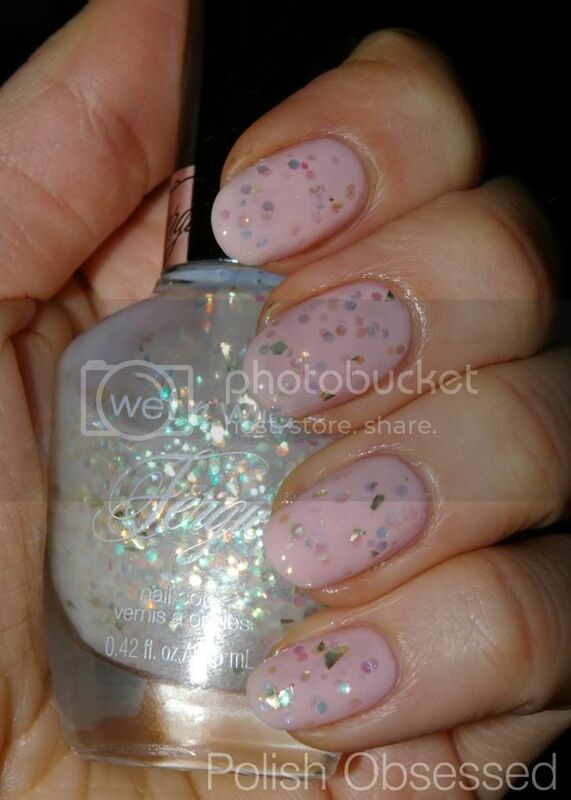 Super girly and pretty and it covered up the imperfections from the base polish... That is until it started to bubble! No luck with I Theodora you this time, such a shame. At least I had a day with this look, the bubbles kind of mixed in with the glitter, but it just bothered me to the point of removal. One last note before the weekend, inspired by Mardi Gras and St. Patrick's day, for the Month of March I will be sporting green and purple on my nails exclusively. I am doing this on my own but if you'd like to join me let me know, I'd be happy to link your blog in my March posts if your are interested.